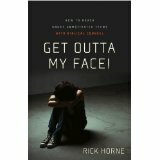 Rick Horne provides an accurate view of our current situation and how parents and others who work with teens can address the issue of anger. Both adults and teens are guilty of sinful actions and attitudes. Horne reminds us of this truth and throughout the book uses Scripture to support his suggestions. When talking with teens, we must remember that they are not the only ones who sin. We are not to ignore their sin, but by remembering our own tendencies we can open doors to reaching teens. By determining to glorify God in our interactions, we present a stance that will lead teens to open up and talk. Clarifying narrow requires the firm foundation of the bridge that you have built. Leading the teen to recognize her “wise wants” and that she has the power to choose either wisely or poorly leads helps in clarifying her situation. This process helps the teen to see the relationship of cause and effect in her choices. Obviously, her relationship with Christ will affect how she chooses and how you address her. Looking wide for your teen’s solutions means finding exceptions in previous behavior. In the past, he has chosen wisely and thus produced good results. This can provide a pattern and encouragement for future choices. Horne gives wise counsel saying that we need to recognize that resistance on the part of our teen may mean we are pushing our own solution rather than allowing him to discover his own. Planning small reminds us that we must not expect too much too soon. Setting an achievable goal sets the stage for long-term resetting of more achievable goals. These goals must also be specific so they can be measurable. Once your teen has achieved one small step in the right direction, you need to keep the conversation going by guiding her to continue to make specific, measurable and achievable goals. Finally, in the last chapter, the author reminds us that the ultimate goal is to point our teen to the cross.